To do this, the researchers collected human breast milk expressed by 35 healthy mothers on the 30th postpartum day. They performed a modified2 QuEChERS extraction technique without cleanup before injecting filtered aliquots (1 mL) into an Accela UHPLC pump coupled to a Q Exactive hybrid quadrupole-Orbitrap mass spectrometer (Thermo Scientific). For separation, they used a Hypersil GOLD column (100 mm × 2.1 mm, Thermo Scientific). The flow rate and injection volume were 300 uL min-1 and 5 uL, respectively. For detection, the research team operated the instrument in both positive and negative electrospray ionization modes for full spectral acquisition (m/z 100–1,000, 50,000 FWHM resolving power). Data were analyzed using Xcalibur 2.0, TraceFinder 3.0 and MetWorks 1.3 software (all Thermo Scientific). The team validated QuEChERS–UHPLC-HRMS by assessing the following characteristics: matrix effects, linearity, lowest calibration level (LCL), recovery and precision. Using a previously established classification system,3 they found no matrix effect for 63% of the analytes and a medium matrix effect (40–80% or 120–150%) for the remainder. None of the samples showed a matrix effect that would be classified as high. Because of the biological complexity of the breast milk itself, the scientists used matrix-matched calibration for accurate quantification. For all mycotoxins, the regression coefficients and linearity were acceptable (r2 ≥ 0.99) and the LCL range was 1 to 50 ng mL-1. The team found satisfactory values for recovery (64–93%) and precision (below 20%). Rubert et al. found the method to be effective for the rapid, simultaneous detection of mycotoxins and metabolites in human breast milk. They note specific effectiveness for the detection of the Fusarium toxin zearalenone that, along with its metabolites, presents in this matrix for the first time in this study. The team identified the following non-metabolized mycotoxins in the samples: zearalenone (10 samples, 29%), neosolaniol (7 samples, 20%), nivalenol (3 samples, 9%) and enniatins A, A1, B and B1 (2 samples, 6%). 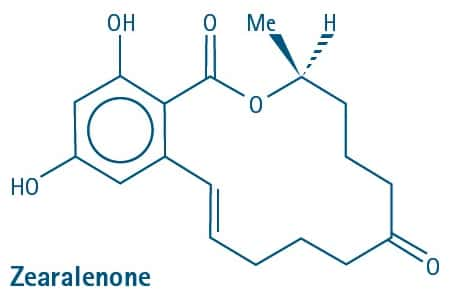 They also detected the following metabolized forms: deoxynivalenol metabolite (1 sample, 3%), HT-2 toxin (10 samples, 20%), T-2 triol (1 sample, 3%) and the zearalenone metabolites α– and β-zearalenol (1 sample, 3%). The authors posit that this information and future related studies may assist clinicians in determining dietary recommendations for women who are pregnant and/or breastfeeding. Furthermore, the data presented here may shed light on maternal and neonatal mycotoxin exposure for toxicological studies and public health risk assessment. 1. Rubert, J., et al. (2014) “Evaluation of mycotoxins and their metabolites in human breast milk using liquid chromatography coupled to high resolution mass spectrometry,” Analytica Chimica Acta, 820 (pp. 39–46). 2. Lacina, O., et al. (2012) “Critical assessment of extraction methods for the simultaneous determination of pesticide residues and mycotoxins in fruits, cereals, spices and oil seeds employing ultra-high performance liquid chromatography-tandem mass spectrometry,” Journal of Chromatography A, 1262 (pp. 8–18). 3. Ferrer, C., et al. (2011) “Overcoming matrix effects using the dilution approach in multiresidue methods for fruits and vegetables,” Journal of Chromatography A, 1218 (pp. 7634–9).